The 1931 Irish Grand Prix at Phoenix Park, Dublin was held over the weekend of 6th and 7th June. On a wet Saturday 6th, cars with an engine capacity of under 1500 cc took part, competing for the Saorstat Cup. 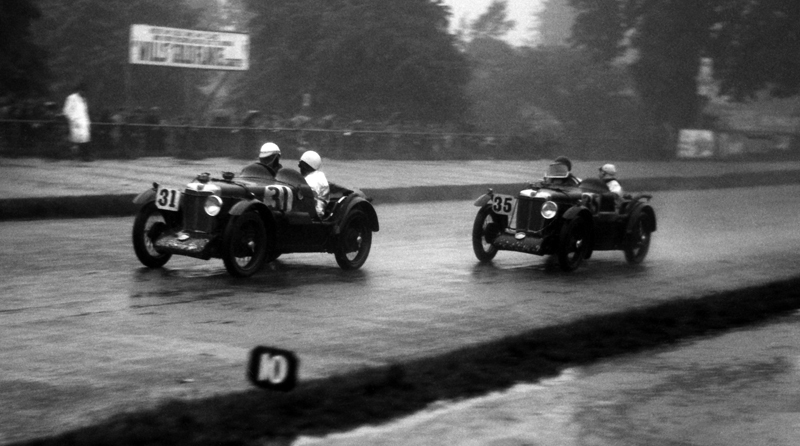 The race was to be dominated by the new MG Montlhery C Type Midgets, fresh from their astonishing success at the final running of the Brooklands ‘Double-Twelve’ event which had taken place less than a month earlier. Motor Sport magazine carried an extensive report on the event which was won overall by Norman Black in an Earl of March entered Midget. They also published this photo in their July 1931 edition with the following caption. “Wet going in the first day’s race. Two MG’s in close formation, the drivers are (31) H.D. Parker and (35) R.T. Horton.” This restored photo courtesy Motorsport Images Ltd.